Whatever you need is NO problem for Me, says the LORD. Wherever you are, I AM! I Am not a regional GOD. I do not give to one at the expense of another. I do not need to! I Am El Shaddai, the GOD of an endless supply, that is MORE THAN ENOUGH. You do not need me to take from the wealthy to give you! Do I need to do that? The silver and gold belongs to Me, who created it in the first place. It has LITTLE VALUE to ME, as My streets are paved with it. It is just something to tread upon. So fret not! For there is MORE THAN ENOUGH FOR YOU, as you trust that you are just as important to Me as the kings that sit in their seats of authority, says the LORD. You are a King and a PRIEST unto Me, says the LORD. I do not see you as little and unimportant, but highly valued. Your position in Me is one of reigning in life AS A KING! I will supply all your need as you come into My presence and glory and eat at the table that I have prepared for you. I will open My good treasures for you, and give you hidden treasures that I have reserved just for you. I want your joy to be full, as you come into My presence, and let Me exchange the garment of heaviness that you carry for My garment of praise and receive from Me the cup of My blessings as you relinquish the bitter cup to ME, says the LORD. 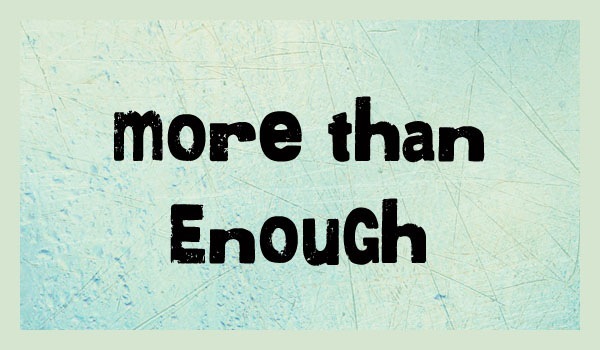 Lord, You are more than enough! Lord please begin to manifest your presence and words unto me! Amen and Amen! Thank you LORD my GOD! Thank You, Lord Jesus, for Your constant Care & Love! !